Stepping on the scale and ear piercing time! In Nebraska it is the time of year when 4-H and FFA market beef animals are officially weighed and tagged. In case you need a refresher, 4-H is the nation’s largest youth development and empowerment organization that reaches more than 7 million youth. In Nebraska, youth need to be 8 to 18 years of age to be in 4-H, and one in every three age eligible youth are members of 4-H! The Future Farmers of America (FFA) is also a youth organization, but for high school youth only. This organization helps in the development of leadership, personal growth, and career success. Both are excellent youth development organizations you should check out if you are not yet familiar with them. As I was saying, market beef (market beef can be steers (males) and/or heifers (females)) weigh-in and tagging days are occurring across the state. It is important to have an “official” record of all animals (and all projects for that matter) that these youth want to exhibit at a fair or other exhibition. Since beef are the largest animal and will need the most time to grow, they are weighed and tagged earlier than the other animals youth can take (i.e. pigs, sheep, goats, rabbits, poultry). Other means of identification are a nose print, yes you read that right, a nose print. Just like no two people will have the same fingerprints, no no two cattle will have the same nose print. Since a nose print never changes this can be a great way to ensure the same animal that was weighed and tagged in January is being shown in July or September. We can also pull a few hairs and follicles from the tail switch to get DNA on an animal. Like the nose print, the DNA will never change and it is a great way to also ensure that the same animal entered is the same one shown many months later. 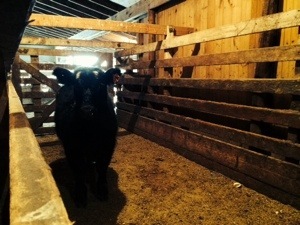 Additionally, many of the larger livestock shows require that a hair sample has been pulled on all animals entered. Once the animal has been tagged, or identified, it is weighed. This will be the beginning weight. Today I was the official “scale master” and weighed all of the animals; the majority weighed between 500 and 800 pounds. It is important for youth to know how much their animal weighs now so they can determine how much they want their animal to weigh at fair. For example, if a steer weighed 600 pounds today (January 4) and the youth wants it to weigh 1250 on July 28; that is 205 days, and it needs to gain 650 pounds. So the youth will need to set a goal for it to gain at least 3.2 pounds a day. That goal is very obtainable. It also teaches youth management of their animal and the animal’s diet, record keeping, and goal setting. 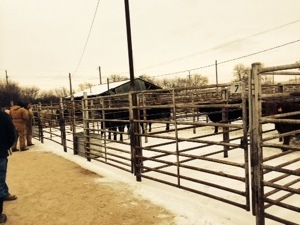 So despite the cold temperatures, Extension folks across Nebraska and many other states are weighing and tagging beef animals in preparation for livestock shows that won’t happen for many months to come. It is all in a day’s work! Market beef animals waiting for their turn – many thanks to all of the volunteers and parents that helped today! This steer is sporting an official ear tag and is getting an official weight!